Cellucor C4 Extreme has risen to become one of, if not the most popular pre-workout supplements on the market, and it is not hard to see why. Suitable for everyone, from beginners to advanced trainers, C4 is a comprehensive product that stimulates and enhances the performance of both mind and body and sports an impressive list of well dosed and effective ingredients. In addition, Cellucor has received more awards and accolades than they can count for this excellent pre-workout formulation. Not only is C4 one of the most popular and effective products on the out there, it also boasts the largest variety of flavours out of any pre workout supplement on the market. It is surely one of life's cruel jokes that someone strong and capable enough to lift hundreds of kilograms or run a marathon can be reduced to an indecisive mess by a task as simple as choosing a flavour of pre workout! The first bit of good news is that you can't go wrong – all ten flavours are very well received and there are no duds. It is clear that the range has been designed to cater to a range of different tastes. The second bit of good news is that we're here to help! #10 Strawberry Margarita – Definitely one for people with a sweet tooth, Strawberry Margarita is more reminiscent of strawberry flavoured candy than fruit. This is probably the most divisive flavour of C4 and the people who find it too sweet are balanced out by die-hard fans. #9 Fruit Punch – The fruit punch flavoured pre-workout sits alongside vanilla icecream and plain chips in the grand tradition of staple flavours, and C4 do a very decent take on this classic. Fruit punch is easy to drink, inoffensive and is a great choice if you're new to the world of supplements or just can't decide. #8 Orange – It's surprising that orange flavoured pre-workouts aren't more common, because C4 demonstrates how tasty an orange flavoured drink can be. Lighter in taste than some of the other varieties, this flavour goes down easy. #7 Peach Mango – This flavour is as tasty as it sounds, Peach Mango isn't available everywhere, but we're glad it's available in Australia. If you like your stone fruits, then this one's for you. It's a little bit artificial, but it's light on the palate without being overly sweet. Easy to go down as with most flavours. #6 Lemon Lime – One of the most popular flavour options on the market, it's a surprise that this flavour wasn't in the top 5. There's nothing wrong with the flavour, it's a slightly tangy, favourite, but one that you can easily get used to. It's still good though, but maybe in smaller servings. #5 Pineapple – Tangy and tropical, pineapple is one of the stronger flavours in the C4 range. Like strawberry margarita, pineapple is more candy than fruit, and will take anyone who fondly remembers the taste of yellow five-flavour lifesavers on a nostalgia trip. #4 Watermelon – Watermelon flavouring can go either way, but Cellucor have nailed it with C4. It has an unmistakable taste, and it is very easy to drink. The increasing popularity of watermelon flavouring in supplements attests to how well this flavour is received. #3 Blue Razz – Blue razz is probably the second most popular pre workout flavour after fruit punch, and it is one of C4's best flavours. Blue Razz is not overpoweringly sweet, and just tangy enough to make the drink very more-ish. #2 Green Apple – It's hard to think of many apple flavoured supplements on the market, and C4 have something quite unique with this flavour. Sitting somewhere between candy and apple juice, green apple is refreshing, delicious, and justifiably holds the number two spot. #1 Pink Lemonade – This is exactly what you want a pre workout to taste like. The subtle lemony tang works with, not against the slight bitterness of some of the ingredients, and the sweetness is at just the right level. 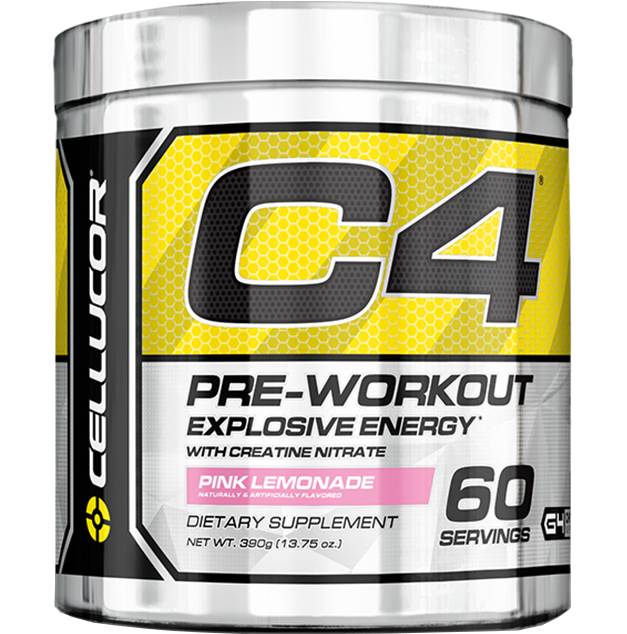 Unlike some pre workouts which can be very artificial, C4 Pink lemonade has a familiar taste which is both pleasant and refreshing. A benefit of having so many flavours in a range is that you have the ability to mix and match to create your own new flavours. Some popular C4 'recipes' are Orange and Pineapple – one scoop of Orange and one of Pineapple, and Margarita and Lemonade, which you can make by combining Strawberry Margarita and Pink Lemonade flavours. The sky is the limit. One surprise we found when crunching the data to come up with these rankings was that there were no real stand out flavours – the numbers were very similar throughout the whole range, which is quite remarkable for a product that comes in so many different varieties. On top of this, each flavour had its share of very opinionated lovers and haters. When choosing a flavour, it is best to go by the descriptions and find something that appeals. There is a flavour of C4 to suit everyone. Enjoy!